The signature event of the Spina Bifida Association of AZ! 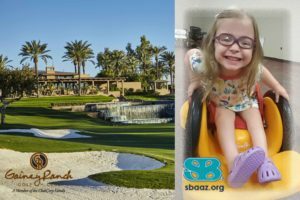 Join us in making life a little better for someone born with SB by selecting your most generous sponsor level and bringing a team of golfers to catch a glimpse of the services and programs SBAAZ provides to our local families and adults. Sponsors and golfers have raised over $450K through their support of this event since it began in 1999. Save on processing fees, send a check.